The general trend in the technium is a long-term migration away from selling products to selling services. 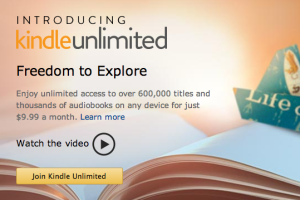 Jeff Bezos has long said the Kindle is not a product, but a service selling access to reading material. That distinction will be made even more visible very shortly when Amazon introduces an “all you can read” subscription to their library of ebooks. Readers will no longer have to purchase individual books, but will have the option to subscribe to all books (600,000 to begin with), like you do to movies on Netflix. As a paying subscriber you get access to any book in print (eventually). Amazon books is a service not product. Verb not noun. In this migration the ultimate vehicle for selling a service is not a store (which is for selling products) but a platform. A platform allows you to sell services which you did not create, just as a store allows you to sell products you did not create. If you are trying to sell services and you don’t have a platform, then you have to make them all yourself, and it won’t scale. Jeff Bezos has turned Amazon into a platform that sells services that others provide. Apple, Microsoft, Google and Facebook all also see themselves as platforms. All these giants employ third party vendors to make use of their platform. All employ APIs extensively. Sometimes platforms are called ecosystems, because in true ecological fashion, supporting vendors who cooperate in one dimension may also compete in others. For instance, Amazon sells both brand new books from publishers, and it sells — via its ecosystem built of used books stores — cheaper used versions. Used book vendors compete with each other and with the publishers. The platform’s job is to make sure they make money (add value) whether the parts cooperate or compete. Which Amazon does well. People have traditionally subscribed to services that entailed a never-ending stream of updates, improvements, versions, that forced a deep interaction and constant relationship from the producer to the consumer. To ease that relationship, a customer committed to a product (phone carrier, cable provider) and was promised uninterrupted quality. The first standalone product to be “servicized” was software. This mode is called SAS, software as service. As an example of SAS, Adobe no longer sells it’s software as discrete products with dated versions. Instead you subscribe to Photoshop, InDesign, Premier, etc, or the entire suite of services. You sign up and your computer will operate the latest best versions as long as you pay the monthly subscription. This new model entails are re-orientation by the customer who may be used to thinking of software as a product her or she owns. And so on. Yes, even physical things can be delivered as if they were digital. If only Apple and other vendors would get their act together and more seriously compete with amazon for the ebook market… On the one hand, as a reader, it’s very appealing to be able to access all these ebooks through the new Kindle subscription program, and as an author with a few titles in Kindle Select, I’m happy to have them available for a look-see to those might not have purchased them outright. But, if I understand things correctly, ebooks for sale on iTunes or elsewhere are not eligible. So to get into this giant new venue (I do think it’s going to be giant), one has to pull one’s books from other platforms?! Hmm. About renting. One thing that is difficult to articulate… the nature of the “vibes” in used stuff. Other than a few esoteric writers (I’m thinking of Karen Kingston especially) almost no one talks about this. But I think the “vibes” are felt by some people and this is– in part– why so many insist on buying things new, and also why some people pay outrageous amounts for, say, Jackie O’s plastic pearls, or an autographed baseball. Interestingly, Karen Kingston claims she can zap the vibes with a special kind of bell. So, hey, maybe there’s a market there! Vibe-clear preowned whatever. It’s really the trend. I think the robot car will take the place of most of taxies in the future. I haven’t yet had a paper book turn around and not let me read it, but several times I’ve found that my phone or tablet has decided that the kindle app is logged out — and I’m somewhere with no wifi connectivity — and so it won’t let me read anything, not even books that are downloaded and cached on it.